In the marketing world, who doesn't like social integration? It can do wonders to spread the word about your product or service, help you reach new customers, and enhance the experience of your already existing customers. For those who want to leverage the power of the social media to increase their marketing effectiveness, we're announcing some major new features! The Campaign "Facebook Like Button"
We added the Facebook Like Button to the email editor. Now you can embed a Like button directly into your campaign, so customers can like your campaign directly, with a click of the button. 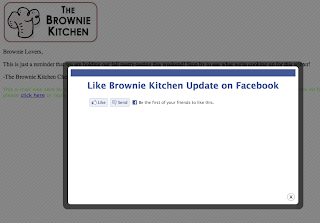 Clicking the Like button brings the recipient to your campaign page, with a dialog that allows them to click a "Facebook Like Button" to Like your campaign. It also shows them the total number of "Likes" the campaign already has and which of their friends have Liked it already. Liking has several benefits-- It makes a lasting connection between your campaign and the recipient's Facebook account, shares the campaign with the recipient's friends, and shows both the recipient and their friends that have also Like the campaign that they share this in common. This does wonders to inspire new viewers of your campaign, as more friends experience the phenomenon of social pressure. 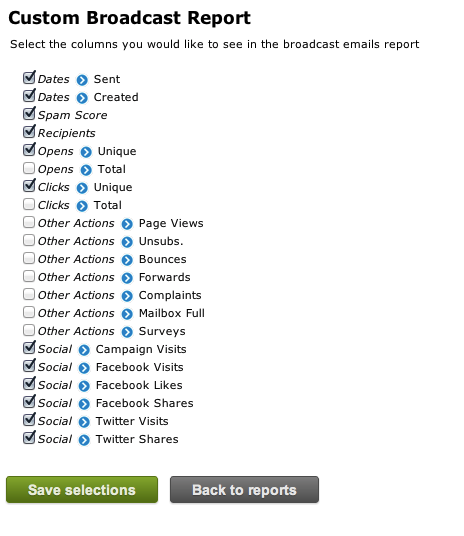 We added more to your campaign page-- granular social tracking of visitors. The campaign page is the webpage that visitors see when they view the campaign as a webpage, share a campaign on Facebook or Twitter, or click on a campaign link that has been shared anywhere on the internet. Now you can know more about the visitors seeing your page, how many, and where they're coming from. Now there are quite a few fields available to you on the Broadcast Reports page now. To make it easier to view campaign data, we've restructured the page to allow you to choose which fields you wish to display and hide those less important to you, when viewing your broadcast reports. To display the new social fields, click the link at the bottom of the Broadcast Reports page that says "Customize This View". This takes you to a page where you can choose which fields you want to display. You may want to uncheck some fields you aren't particularly interested in at the moment and add the social fields you wish to see, unless you have a huge resolution setup! We might as well let you in on some other new things we've been working on that aren't particularly related to this social stuff. By customer request we added new restriction options for "Other Logins" in your organization. Now you can restrict access to Billing History, Complaint History, and Usage History to other members of the team that just need to focus on their individual tasks on JangoMail. We'd be happy to add more granular restrictions like these as well, just send us a note and tell us what you'd like to see! We did some re-working of the way click tracking and link forwarding pages work. You wont notice anything immediately different on the frontend, but behind the scenes things are working faster and more reliably. Click tracking and forwarding is a big concern of ours, so if there is anything we can do to improve the process, you bet we'll do it. We've got a lot of new things cooking right now so stay tuned and get excited for what's on the way. More social integrations, more useful features, more enhancements and design refinements--we're in the business to bring you the best email marketing experience in the industry and it's a fulltime job! Please send us feedback, requests, questions, thoughts, and whatever else is on your mind. Nothing moves mountains faster. Thanks for working with us!